As much as I love this time of year, the long dark nights really make me want to hibernate. This time of year is all about getting cosy and for me that also means comfort food. 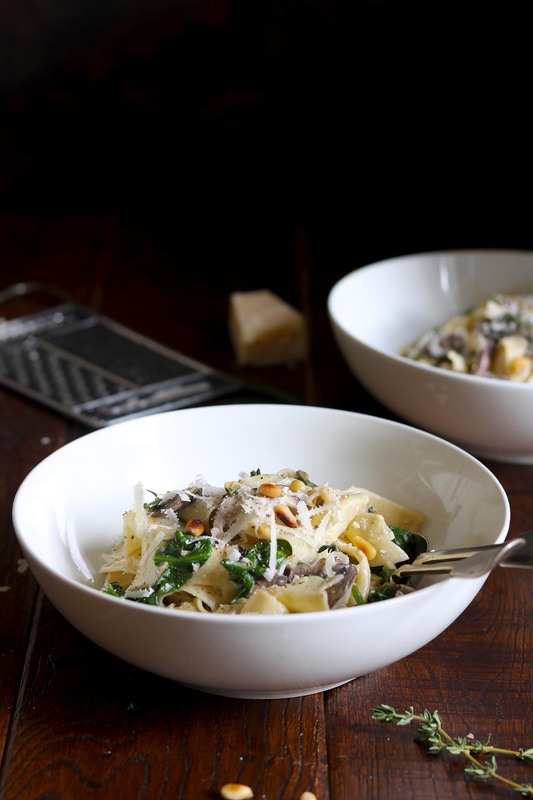 This creamy, spinach and mushroom pasta, is exactly that, cosy comfort food. It’s perfect for cold nights and quick enough for a great weeknight dinner. And hello, mushrooms, I think anything with mushrooms is a winner but don’t just take my word for it, my family loved this too. It’s really tasty and satisfying, just what you need on these cold evenings. I used a mixture of mushrooms for this recipe, Chanterelle being the main mushroom, then chestnut and then just a few shiitake mushrooms. You could mix that up if you like or go with just chestnut mushrooms, I’ve made this with just chestnut mushrooms and that works very well too. I love mushrooms so the type of mushrooms I’ve chosen for this dish gives a great mushroom flavour, slightly earthy even. For the spinach I went with baby spinach leaves as I wanted the leaves to be nice and small, they wilt quicker that way. The result is a lovely, creamy spinach and mushroom pasta. The choice of your pasta for this recipe really depends on how greedy hungry you are. I went for a nice thick pappardelle pasta, hey, I was hungry! Tagliatelle or linguine would work great too and I think penne would also be a good choice. This spinach and mushroom dish comes together fairly quickly, it’s ready in under 30 minutes so it would be perfect for a weeknight dinner or for Meat Free Monday. The toasted pine nuts give a little toasty warmness to this recipe and I have used 3 good sized cloves of garlic too, the pine nuts are essential but you could reduce the amount of garlic if you don’t want to scare off any vampires! 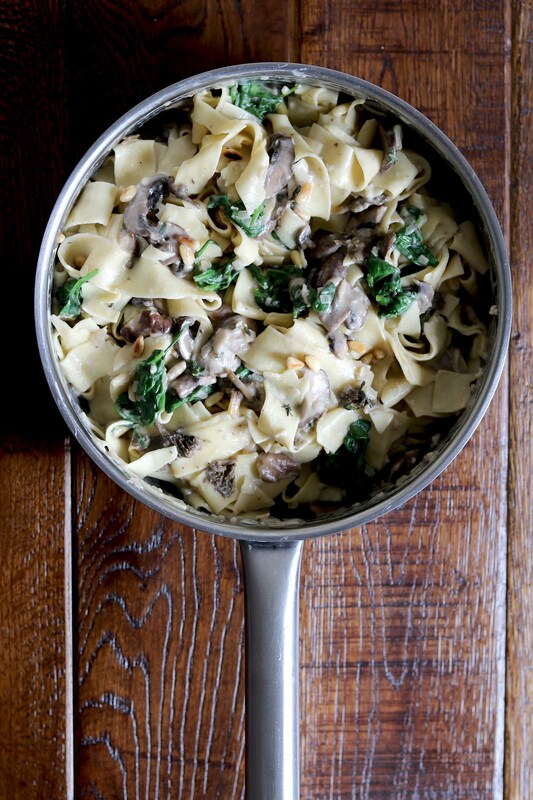 A comforting pasta dish with wild mushrooms, spinach and pine nuts. Heat the oil in a large sautee pan, add the shallots and cook over a low to medium heat for about 5 minutes or until the shallots are soft. Bring a large saucepan of water to the boil and add the pasta, cook until the pasta is almost cooked. Add all the mushrooms plus the butter to the sautee pan and cook over a medium heat until the mushrooms release their juices. Add the garlic and thyme and gook for another minute or two. Now add the flour, mustard and creme fraiche and stir well. Add a large serving spoon of the pasta water to the mushrooms then stir, keep adding a spoon of water until you have a creamy sauce. I added about 6 large spoons. Then stir in the parmesan. Now add in the spinach, salt and pepper. Stir until the spinach has wilted. Stir in the pine nuts then add in the drained pasta. Toss the pasta in the sauce then serve immediately with some grated parmesan, freshly cracked black pepper and a few thyme leaves as a garnish if you wish. Calories are approximate, cup sizes are also approximate, I weigh all my ingredients using a metric scale. Try adding chicken to this, cook chicken breasts cut into bitesize chunks in olive oil, once cooked through remove from the pan then return to the pan after step 3. Creamy Chicken & Mushroom Tagliatelle. This pasta recipe combined some unbelievably tasty and awesome ingredients, Michelle. I am definitely going to give it a try! The photos really make this recipe come alive! I love creamy pastas, especially with papperdelle, and the combination of spinach, pine nuts, and mushroom just sounds fantastic. I can’t wait to try it out for myself! I love mushrooms in pasta! This looks simply divine!